"Project Gunrunner" (A.K.A Fast and Furious) was a project of the Bureau of Alcohol, Tobacco and Fireworks where basically some "geniuses" high up in ATF (and possibly the DOJ) thought it would be a great idea to sell assault weapons to the violent Mexican drug cartels. Yes, that's right, the US government decided--in order to fight the Mexican Drug Cartels, we should arm them and let them keep their weapons once they were used in committing crimes . Yesterday morning we learned that the administration was trying to obstruct the congressional hearings with intimidating letters to the ATF agents about to testify, later in the day we learned why, at least one person on the White House staff was told about the flawed operation. With Special Agent in Charge William Newell sitting on the committee hot seat, we not only know that the program's strategy found its way into the White House, but to the IRS, Drug Enforcement Agency and ICE. Newell says O’Reilly was “asking about the impact of Project Gunrunner to brief people in preparation for a trip to Mexico… what we were doing to combat firearms trafficking and other issues.” A White House spokesman denied this exchange had anything to do with Operation Fast and Furious. LABRADOR: Special Agent Newell, do you know who Kevin O'Reilly is? LABRADOR: What's the nature of your relationship with him? NEWELL: I've known Kevin for ‑ I'd say probably 10‑12 years? LABRADOR: How often do you communicate with him? NEWELL: Oh, I haven't communicated with him in a while but probably three or four times a year or something like that. Or maybe ‑ maybe more depending on him reaching out to me. LABRADOR: Isn't it a little bit unusual for a special agent in charge of an ATF field division to have direct email contact with the national security staff at the White House? NEWELL: He's ‑ he's a friend of mine. LABRADOR: How many times did you talk to him about this case? NEWELL: The specifics of this case? I don't think I ‑‑ I mean ‑‑ I don't think I had one specific conversation with him about the specifics of this case. ISSA (? ): Would the gentleman allow me to help him a little? Not that you need it, but could you take the word specific out and ‑ and answer the general ‑‑ did you talk to him about this case? NEWELL: I might have talked to him about this case. Yes, Sir. ISSA(? ): Do you know when that was? NEWELL: It was probably ‑‑ I ‑‑ as I recall I think it was during the summer ‑‑ it might have been the summer or early fall of 2010. GOWDY: Well, but that's kind of a pleonasm, isn't it, because you are getting it from them? So it's a ‑‑ what do you mean by that, "You didn't get this from me..."? I'm referring to your e‑mail to Mr. O'Reilly (ph). NEWELL: Well, obviously Mr. O'Reilly (ph) was a friend of mine and it's ‑‑ it's ‑‑ I shouldn't have been sending him that, obviously, I recognize that, it being a friend. NEWELL: It's ‑‑ he's been a friend of mine for a long time and he asked me for information. So I gave him information that ‑‑ it's probably an improper use of the term or phrase. 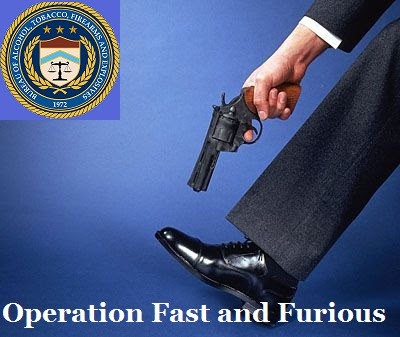 Operation Fast and Furious has become like a dripping faucet, every day a bit more information leaks out. Just this week we learned that conflicted US felons were allowed to purchase weapons without background checks, an administration cover up, and that the scope of the project was much wider than originally thought. Maybe its time for the Administration fess up and stop stonewalling.